Ki-1 (CD30) antigen expression is not found on peripheral blood cells but its expression can be induced in vitro on T and B lymphocytes by viruses and lectins. Expression of CD30 in normal tissues is very limited, being restricted mainly to a subpopulation of large lymphoid cells; in particular, cells of the recently described anaplastic large cell lymphoma (ALCL), the Reed-Sternberg (RS) cells of Hodgkin's lymphoma and scattered large parafollicular cells in normal lymphoid tissues. More recent reports have described CD30 expression in non-hematopoietic and malignant cells such as cultured human macrophages, human decidual cells, histiocytic neoplastic cells, mesothelioma cells, embryonal carcinoma and seminoma cells. We investigated the immunohistochemical expression of CD30 antigen in 15 paraffin-embedded tissue samples representing small intestines from fetuses after spontaneous abortion in the 8th, 10th and 12th weeks using the monoclonal antibody Ki-1. Hormones had been administered to all our pregnant women to support gestation. In addition, a panel of monoclonal antibodies was used to identify leukocytes (CD45/LCA), B-lymphocytes (CD20/L-26) and T-lymphocytes (CD3). Our findings were correlated with those obtained simultaneously from intestinal tissue samples obtained from 15 fetuses after therapeutic or voluntary abortions. The results showed that: (1) epithelial cells in the developing intestinal crypts express the CD30 (Ki-1) antigen; (2) CD30 expression in these epithelial cells is higher in cases of hormonal administration than in normal gestation. In the former cases (hormonal support of gestation) a mild mononuclear intraepithelial infiltrate composed of CD3 (T-marker)-positive cells accompanies the CD30-positive cells. CD30 antigen, a member of the tumor necrosis factor (TNF) receptor superfamily [1–3], was originally identified as a cell surface antigen on primary and cultured Hodgkin's and Reed-Sternberg cells by use of the monoclonal antibody Ki-1 [4, 5]. CD30 antigen is normally expressed by a subset (15–20%) of CD3+ T cells after activation by various stimuli . Its expression is stimulated by interleukin (IL)-4 during lineage commitment of naïve human T cells [7, 8] and is augmented by the presence of CD28 co-stimulatory signals . CD30 also is expressed at variable levels in different non-Hodgkin's lymphomas (NHL) as well as in several virally transformed T and B cell lines [5, 10]. In particular, CD30 is a specific marker of a subset of peripheral T cell NHLs known as anaplastic large cell lymphomas (ALCL) . More recently, preferential CD30 expression has been detected on a subset of tissue and circulating CD4+ and CD8+ T cells producing mainly Th2 cytokines in immunoreactive conditions [11–14]. CD30 appears to have an important immunoregulatory role in normal T cell development. Within the thymus, CD30L is highly expressed on medullary thymic epithelial cells and on Hassal's corpuscles . Pallesen and Hamilton-Dutoir  were the first to report CD30 expression outside lymphoid tissue in 12 out of 14 cases of primary or metastatic embryonal carcinoma (EC) of the testis, using immunostaining with the monoclonal antibodies (MAbs) Ber-H2 and Ki-1. Subsequently, several investigators have confirmed their results and have detected CD30 in these carcinomas at the protein [17–20] and the mRNA  level. Two reports demonstrated CD30 expression in 4/21 and 4/63 cases of testicular and mediastinal seminoma  and in the seminomatous components of 7/14 cases of mixed germ cell tumours of the testis . Suster et al. 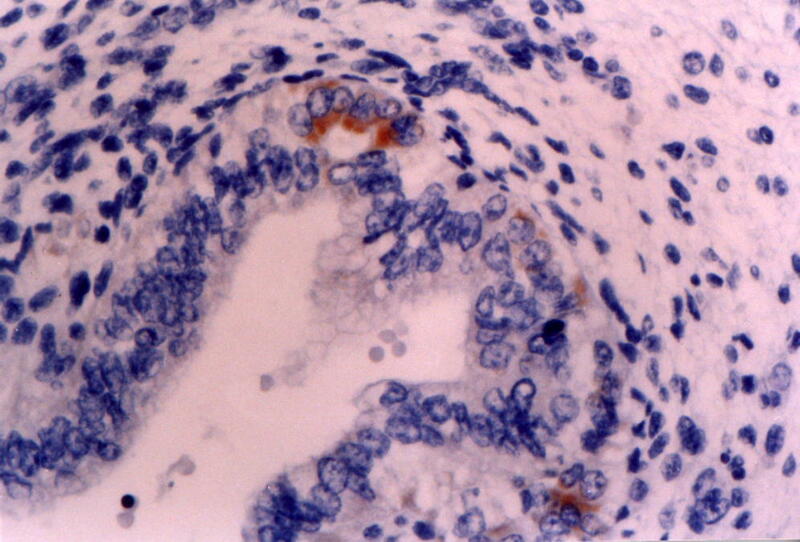 detected the CD30 antigen in 6/25 yolk sac tumours of the testis and mediastinum . CD30 expression has also been reported in other non-lymphoid tissues and cells such as soft tissue tumours , decidual cells [24, 25], lipoblasts , myoepithelial cells , reactive and neoplastic vascular lesions , mesotheliomas , cultivated macrophages, and two histiocytic malignancies . Primitive crypts (epithelial downgrowths into the mesenchyme between the small intestinal villi), appear in the postpharyngeal foregut between the 9th and 12th weeks of embryo development. Goblet cells are present in small numbers after 8 weeks, Paneth cells differentiate at the base of the crypts in weeks 11 and 12, and enteroendocrine cells appear between weeks 9 and 11. The fact that the CD30 molecule can mediate signals for cell proliferation or apoptosis  prompted us to perform a systematic investigation of CD30 antigen expression in non-hematopoietic embryonal tissues during the proliferation and differentiation stages, beginning with the epithelial cells of the developing intestinal crypts. Samples representing 15 small intestines from fetuses after spontaneous (involuntary) abortion occurring in pregnant women treated with progesterone (300–600 mg per day until the 12th gestational week), and 15 small intestines from fetuses after therapeutic or voluntary abortion, were obtained in the 8th, 10th and 12th weeks of gestation. The Regional Ethics Committees approved the study. Written informed consent was obtained from all individuals and the procedures followed accorded with institutional guidelines. Small intestines were cut in 3 mm slices and fixed in 10% neutral buffered formaldehyde at 4°C for 24 h, then processed for routine paraffin embedding. Paraffin blocks were available in all cases, and 3 μm thick tissue sections were stained routinely with hematoxylin-eosin, PAS and Giemsa, and subsequently by immunohistochemistry. Immunoperoxidase labeling was performed as follows: sections were deparaffinized in 70% alcohol and endogenous peroxidase was blocked with 3% H2O2 in methanol. The sections were preincubated in 20% serum of the species from which the secondary antibody was raised, and the primary antibody was applied. After overnight incubation at room temperature, the secondary biotinylated antibody was applied for 30 min. Staining was visualized with a Vector Elite System (Vector Laboratories, Burlingame, CA) using diaminobenzidine as the chromogen. The sections were counterstained with dilute hematoxylin. The primary antibodies used were as follows: (CD30/Ki-1) activated lymphoid cells, mouse monoclonal antibody (Novocastra); (CD45/LCA) leukocyte common antigen, mouse monoclonal antibody (Dako); (CD20/L-26) B-lymphocytes, mouse monoclonal antibody (Dako); and (CD3) T-lymphocytes, mouse monoclonal antibody (Dako). We used the high temperature antigen unmasking technique for immunohistochemical demonstration of CD30/Ki-1 on paraffin sections (Novocastra). Control slides were incubated with nonimmunized rabbit serum. An anaplastic lymphoma case-slide (positive control) was run in parallel with the assay. For each sample, the CD30/Ki-1 positive population was assessed by enumeration of labeled cells in each tissue compartment for a minimum of five random fields per section viewed at 40-fold magnification through a grid. Cell numbers were calculated per mm2 of tissue section. The counted areas were selected from random tissue sections, taking into account that the ratio of the area of the intestinal stroma to the area of surface epithelium covering the crypts was representative of the entire field. Areas with obvious necrosis or haemorrhages were excluded. Statistical analysis was performed using the ANOVA test. Five microscopic fields of the small intestines were evaluated in each case without knowledge of the clinical data (TABLE 1). Two observers examined the sections independently, and positive cellular staining for each antibody was manifested as fine brown cytoplasmic granularity and/or surface membrane expression. 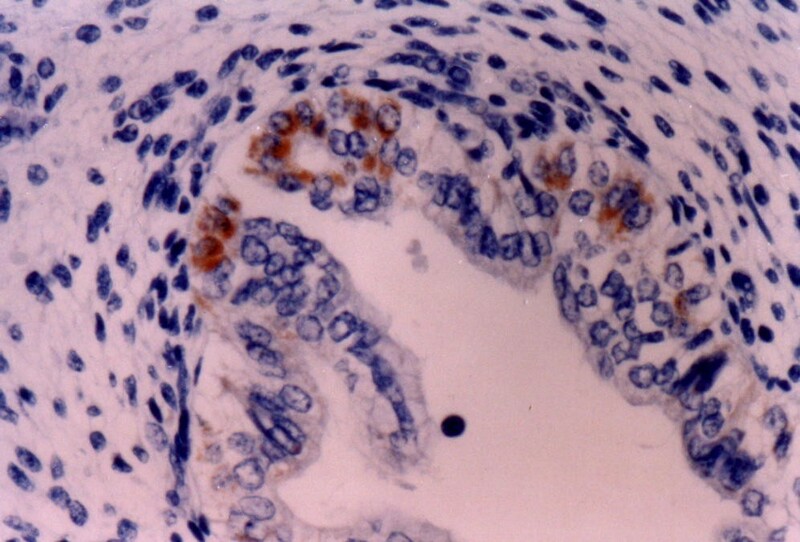 Expresion of CD30 antigen in fetal intestinal cryptae cells during the first trimester of gestation. In cases of spontaneous (involuntary) abortion, immunohistochemistry revealed small clusters or scattered, large-sized CD30/Ki-1 positive cryptae cells within the intestine in all settings examined (Fig. 1), with percentages varying from 3.2 to 3.9 (mean ± sd = 3.61 ± 0.16). In the neighbouring intestinal stroma a slight cellular infiltration was observed, consisting of rounded mononuclear cells approximately 10 μm in diameter with eccentric kidney-shaped nuclei and expressing a CD45/LCA and CD3 phenotype. In cases of voluntary or therapeutic abortion, immunohistochemistry showed a smaller number of large-sized CD30/Ki-1 positive cryptae cells in all settings examined (Fig. 2), with percentages varying from 3.1 to 3.7 (mean ± sd = 3.42 ± 0.17). No inflammatory infiltrates or necrosis were noted in the neighbouring intestinal stroma. 8 th week of gestation (involuntary abortions). Ki-1 (CD30) antigen is expressed by a small number of epithelial cryptae cells. Immunohistochemical stain X 400. 8 th week of gestation (voluntary abortions). Weak to moderate expression of Ki-1 (CD30) antigen in the developing crypts. Immunohistochemical stain X 400. In cases of spontaneous abortion, immunohistochemistry showed a higher number of positive CD30/Ki-1 cryptae cells than at the 8th week of gestation (Fig. 3), with percentages varying from 4.9 to 5.6 (mean ± sd = 5.27 ± 0.19). There were very few inflammatory infiltrates in the intestinal stroma expressing the phenotype CD45/LCA and CD3. In cases of voluntary or therapeutic abortion, the frequency of CD30/Ki-1 positive cryptae cells was similar to that at the 8th week of gestation, with percentages varying from 3.2 to 3.9 (mean ± sd = 3.43 ± 0.18). No inflammatory infiltrates or necrosis were noted in the neighbouring intestinal stroma. In spontaneous abortion cases the number of CD30/Ki-1 positive cryptae cells was even higher than at 10th week, with percentages varying from 4.8 to 5.7 (mean ± sd = 5.34 ± 0.23). The number in cases of voluntary or therapeutic abortions was more or less the same as at 8th and 10th weeks, with percentages varying from 3.2 to 3.7 (mean ± sd = 3.41 ± 0.17). No differences in immune reaction were noted in the neighbouring intestinal stroma in cases of either spontaneous or voluntary/therapeutic abortion in comparison to the 8th and 10th gestational weeks. The differences among the numbers of CD30/Ki-1 positive cells at the 8th, 10th and 12th gestational week after spontaneous abortion were statistically significant (p < 0.0001). No significant differences were observed in the numbers of these cells after voluntary or therapeutic abortions (p = 0.95). The value of the CD30 antigen as a diagnostic marker for Hodgkin's lymphoma and anaplastic large cell lymphoma is well documented [4, 5, 31]. However, the function of this cytokine receptor in Hodgkin's lymphoma and other CD30-positive diseases is still not clear. CD30 appears to have an important immunoregulatory role in normal T cell development. In normal cells, this transmembrane glycoprotein can be induced on B and T lymphocytes by mitogen stimulation or viral transformation [32–34]. cDNA cloning has revealed that the CD30 protein is a cytokine receptor of the tumor necrosis factor receptor superfamily [1, 35], the ligand of which belongs to the tumor necrosis factor family [22, 23]. Recent in vitro data indicate that the CD30 receptor-ligand complex can mediate signals for cell proliferation, apoptosis and cytotoxicity in lymphoid cells [20, 36, 37]. Our results give the first indication that the CD30 antigen is expressed in the epithelial cells of developing intestinal crypts. This observation has a number of important implications. First, our findings are of significance with regard to the accepted origin of R-S cells. Care must be taken when drawing histogenetic conclusions based on the identification of a single marker in different cell types. Shared expression of CD30 antigen does not necessarily relate Hodgkin and R-S cells to activated lymphocytes. The identification of this antigen in cells as apparently disparate as activated lymphocytes, R-S cells and now human epithelial cells of the developing fetal intestinal crypts suggests that previous views about the nature of the Ki-1 antigen must be re-examined. The Hodgkin and Reed-Sternberg cells are indeed lymphocytes as they harbor rearranged immunoglobulin (in more than 90% of cases) and T cell receptors . Although the expression of CD30 antigen may indicate a relationship between these cell types, it is likely to be less straightforward than was previously supposed. Identification of the normal physiological role of CD30 antigen is thus made even more imperative if these relationships are to be understood. Second, these findings indicate that outside the lymphatic system, CD30 antigen expression in the epithelial cells of developing intestinal crypts can mediate signals for cell proliferation and differentiation in a region where other cell types (stem, goblet, Paneth and enteroendocrine) grow throughout life. Third, CD30 expression in the epithelial cells of the developing intestinal crypts is induced by progesterone. This is a novel mechanism of CD30 induction, distinct from neoplastic transformation and viral infection of lymphocytes. The demonstration of large R-S like cells in the developing crypts within a lymphoplasmacytic infiltrate, in the same way that similar R-S like cells are observed in reactive lymph nodes, especially within the parafollicular areas, is evidence that such cells might represent the physiological counterparts of R-S cells. The possibility that CD30 is an oncofetal antigen is supported by our positive findings in fetal intestinal cryptae cells. We have so far been able to investigate only a single tissue from a small number of fetuses of early gestational age. Pallesen and Hamilton-Dutoit  examined CD30 expression in normal adult, neonatal and fetal (week 28) testes, as well as other tissues (brain, spinal cord, lung, gut, kidney, erythropoietic tissue, muscle, bone and connective tissue) from fetuses of 11 and 12 weeks gestational age, with negative results. 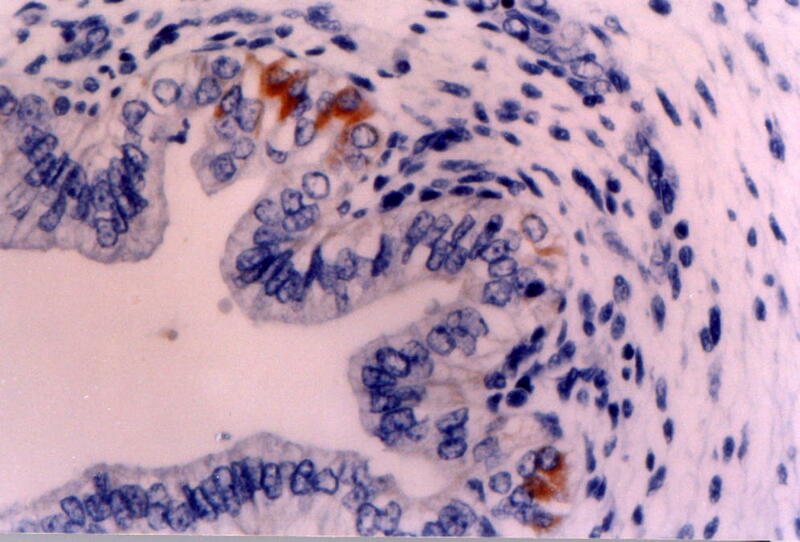 This is the first demonstration of CD30 in epithelial cells in fetal tissue. Although our results require confirmation from frozen sections, they – together with a reported positive staining in placenta [24, 25] – suggest that the antigen is expressed by proliferating and differentiating epithelial cells of other than lymphoid origin. Clearly the extent of expression of CD30 antigen in embryonal tissues warrants further investigation.